Part of a series of teachings based on the The Gradual Path to Enlightenment (Lamrim) given at Dharma Friendship Foundation in Seattle, Washington, from 1991-1994. Great pride—why do we have to be the best to feel worthwhile? We have been going through the four noble truths, talking about our unsatisfactory experiences, their causes, their cessation and the path to end suffering. We have gone into the unsatisfactory experiences in great depth. So, if you still think you are having fun in samsara, listen to the tapes [laughter] and think again. We started going into more depth on the causes of the unsatisfactory experiences. These are what we call the afflictions1 or distorted notions that we have in our mind which put us again and again in problematic situations. There are six root afflictions that are the principal causes of all the unsatisfactory experiences. We have talked about the first two of the six: 1) attachment and 2) anger. Today we are going to talk about the third one, which is pride. 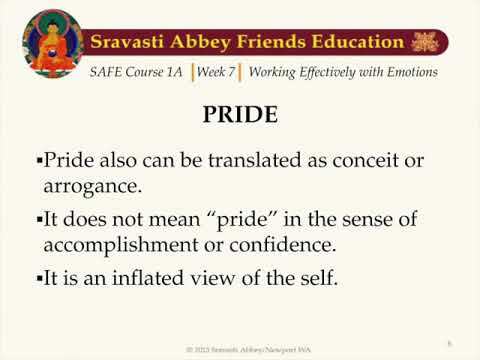 Pride is sometimes translated as conceit or arrogance. Pride is not an exact translation for this third root affliction because pride can be used in a positive way in English (e.g. you are proud of your work in the sense that you feel a sense of accomplishment). This is not the kind of pride that we are talking about, but rather a defiled state of mind. Here, we are talking about the kind of pride that is an inflated view of the self, a kind of arrogant view as in you are full of yourself. I will explain what is “transitory composite.” This is one of those weird terms that we translate literally from the Tibetan that makes one’s eyeballs roll in English. “Transitory composite” means the aggregates, that is, the body and mind. In other words, the aggregates are composites. An aggregate is a heap that is a composite of mental factors, and it is transitory; it changes. On the basis of the body and mind, this view [of the transitory composite] grasps at an inherently existent “I” or “mine.” It is making yourself full of yourself, making the “I” much bigger than it is, and getting very proud about it. The way pride functions here is that it prevents the attainment of all other virtue. It prevents us from learning anything because we think we know it all already. It is that pride that makes us disrespect others, have contempt for others, look down on others, thereby preventing us from learning anything and resulting in our having very unpleasant relationships with other people. Just as we don’t like being around people who are very full of themselves, other people also feel that way when our pride is manifesting. There are seven variations of pride, seven different flavors that pride takes, giving it interesting twists. The first type of pride is called pride over the inferior. With pride, we compare ourselves to others in terms of education, health, beauty, athletic ability, social standing, economic standing, intelligence, etc. This type of pride is where we are in fact better than somebody else in whatever it is that we are proud over. We are proud over the people who are inferior to us and we look down upon them. It is a real haughty kind of smugness that looks down on other people. It is also the kind of attitude that says, “I may not know very much, but at least I am better off than that jerk.” It has a very nice way of pretending to be slightly humble, like, “I don’t know very much, but in comparison to that idiot, I look really good.” We pretend to be a little bit humble but we are actually looking down on other people. The second kind of pride is called great pride. This is when we are actually equal to others in whatever quality it is that we are proud about. What this brings forth is competition. Whereas the first one brought forth a contempt and deprecation of others, this one brings out the full force of our American competition and aggressiveness to get ahead, be better and leave others behind. If we look in our lives, we’ll see that we spend so much time competing with other people. We were brought up as if this were a healthy way to be. We think that the more we can be proud over somebody else whom we are about equal with and beat them, it means we are a better person. We grow up with this weird notion that in order to be good, we have to humiliate others. That makes it more and more difficult for us to cooperate with people, because how can we cooperate with somebody whom we are competing with and trying to humiliate? When we can’t cooperate with other people, then of course we start feeling alienated; we start feeling cut off from other people. Why? Because we are cutting ourselves off. As soon as we get into this competition mode, we are separating ourselves from other sentient beings and pitting ourselves against them to come out ahead, otherwise our whole self esteem is at stake. This is really a cultural view. Not all cultures function on this. I lived in Asia for quite some time. There, from the time you are a child, you are brought up with this image of yourself as a member of a group. Instead of competing with everybody in that group, your job as an individual is to cooperate with the people in that group because you as an individual are responsible for the welfare of the group while the others are responsible for your welfare too. Somehow the self is a little bit smaller, there is more humility, more willingness to help other people, and people don’t feel as ego-threatened by every small thing that happens. When we have this very individualistic sense of self and a lot of pride, then we compete with everybody else. People appear to us as a threat because of the way we frame the situation. Sometimes you might wonder in your work, “How am I going to work if I don’t compete? This is what it’s all about!” But I think many businesses now are realizing that the more people compete, the more tension you find within the company. More cooperation is being encouraged. I think that if we learn to cooperate with other people instead of competing, it really pays off for our own welfare and our own sense of belonging. Why do we have to be the best? I think it’s real interesting to check up, why is it that we feel we have to be best in order to be worthwhile? Where is that coming from? Why do we have to put somebody else down in order to feel that we are good in something that we do? It’s like people can’t play sports anymore without competing. They can’t go jogging without competing. From the time little kids are three years old on their tricycles, they feel like they have to be better than others. Why? What difference does it make whether we are better than somebody else or not? Also, many of the things that we compete for are inconsequential. VTC: I think that’s often because of the way the parents respond. Like if the child does something, the parent doesn’t say, “Oh, wasn’t that fun?” or “Didn’t you feel good doing that?” or “Wasn’t it nice playing with somebody?” It was like, “Oh, good guy, you beat the other person!” And so, the kid thinks, “Oh, this is how I get my recognition—by beating somebody else.” Our attitude depends on our parents also, what they encourage in us as children. In turn our attitude affects our interactions with other people. The next kind of pride is called pride of pride. [laughter] This is when we are comparing ourselves to others and we are actually inferior to the other person. Remember, with the first pride, we were superior; we looked down on others. With the second pride, we were equals competing with them. Now, we are actually inferior to the other person in terms of our youth, beauty, economics, intelligence or other qualities. But we are still somehow competing with them, we are still coming up with some reason why we are better. It’s like, “I may not know as much about computers as so and so, and they might be really talented, but I practice the Dharma. I have some special virtue.” Or “I may not be able to be as good in jogging or aerobics as somebody else, but at least I am very honest with myself in what I do.” We know we are not as good as somebody else, but we find some special something or other that we can attribute to ourselves as special, some way in which we can put ourselves up. It can be the most insignificant thing, but we will find it. It’s a way of making ourselves more important than the next person even though the other person is better. I have a great example from my own life of this one. I was in college and it was the first time I stayed out all night without my parents finding out. The next day, there was this incredible feeling of “I.” It’s like “I stayed out,” “I’m an adult,” the incredible sense of this big, perfect, powerful “I.” You know that one? Some kind of exaggerated feeling of “I” as being perfect and on top of it all and just there ruling the world, having the last say in everything. Or, things like, “Oh, I heard about what is happening at Bosnia and I just started crying, I think I must almost have the realization of great compassion.” Or “I had this incredibly blissful meditation. I sat down to meditate and I felt I left my body and was floating in space, feeling so light. I must be real close to having calm abiding. My single-pointedness must be getting really refined!” Or “I had this sensation of being empty. I am going to realize emptiness real soon.” The kind of pride, thinking we’ve gotten somewhere on the path when we really haven’t. Maybe we had some good experience, it comes and it goes, but our mind gets really proud over it. Or “Oh, I had this incredible dream—the Dalai Lama appeared to me. Does the Dalai Lama ever appear to you in your dream? And the Dalai Lama gave me teachings in my dream. Does that ever happen to you? No, it doesn’t? Oh, this is too bad.” [laughter] We get blown up thinking that our practice is really flourishing when actually there is nothing happening that is special. You see it all the time—people getting so attached to experiences that happen to them. We put ourselves down but make a big deal out of being affiliated to somebody special. “I am a disciple of a very famous teacher” or “I studied at this great University. I didn’t graduate with honors but I went to Harvard.” Or “I studied with this great professor.” By affiliation we make ourselves big even though we start the sentence out by putting ourselves down. And then, the most famous way that the self-effacing pride can work (the one we are really good at), is “I am lousy. Everybody else at the company does their job well but I bungle my job. Wouldn’t you know it?” Or “Everybody else in the meditation group can sit there for 15 minutes without wiggling their legs, but I can’t.” And “Everybody else understands the meaning of this teaching but I am such a dim-wit, it’s just hopeless.” The pride of being the worst one. If we can’t be the best, we’ll make ourselves important by being the worst. It’s the pride again that makes such a big deal out of everything that has to do with ourselves except here, it’s everything that we do wrong. With the other prides, we are bolstering up everything we do correctly even if it is hardly worth anything at all. Here, we are making a big deal out of everything we do not do well even if it is quite insignificant. It is a way of making ourselves somehow incredibly central to the existence of the universe. The seventh kind of pride is called distorted pride. This is when we are proud of our nonvirtues, our moral degenerations. “I lied on my taxes well, the IRS can’t get me this time.” Or “I told that guy off once and for all, he is not going to bug me again.” It’s these kinds of situations where our morality is really full of holes but we twist it to make ourselves look so good and such a big deal. “I succeeded in duping that guy. He fell for all my lies. I was clever in this business deal.” Or the person who goes around bragging about how many people they slept with. These are the different kinds of pride. I find it very interesting to think about each one. Each of them has a slightly different flavor. We can make examples of each one of them in our life. It is a very good mirror to look at our own behavior and the different ways in which we try and make ourselves important. There are a few different antidotes for pride. The first one I learned was, when you are proud because you think you know a lot, then think about the five aggregates, the six sense organs, the twelve sense sources, the eighteen elements. Meditate on those. “What do you mean meditate on those? [laughter] What are they?” Well, that’s the point. You don’t understand them, so your pride goes down. The idea is when you think you know something, then think about something quite difficult, this then makes you see that you really don’t know much to begin with. That’s one technique. What I personally find a lot more effective is to reflect that everything that I do, know, am or have, actually isn’t mine to start with. It all came due to the efforts and kindness of somebody else. We weren’t born with whatever it is we are proud of. If you are proud because of how much money you make, reflect that you were not born with that money. The money comes due to somebody else giving it to you. Or if we are proud because of being young and athletic or whatever it is, again, this isn’t our innate quality but it comes because other people gave us our body, and other people grew the food that helped our body to grow and be healthy. If we are proud of our education (in a negative way), it’s not our own doing. It’s due to the efforts of all the people who taught us. All those years, they put up with us in school. And so, anything that we are proud over, we can remember how it’s not really ours. If you are proud of your car, reflect that it used to belong to somebody else, and you only have it because somebody happened to give you the money that you traded for the car. Somebody gave it. There is nothing to be proud of in having that. Whatever it is, try to trace its origin and see that it isn’t ours at all. That helps our pride to go down a lot. In the Eight Verses of Thought Transformation , there is one verse that says “Whenever I am with others, I will practice seeing myself as the lowest of all. And from the very depth of my heart, I will respectfully hold others as supreme.” This verse very much counteracts pride. We recognize the harm that pride brings, that it prevents us from learning anything. We recognize the value of being humble. When we are humble, it doesn’t mean that we have a low self-opinion. It means that we have enough self-confidence to admit what we don’t know and be open to learn from other people. It’s when we have self-confidence that then we are open to learning. When we don’t have much self-confidence, we put on the big facade of being quite proud and elegant. We will not let anybody tell us anything. This is quite an interesting thing to be aware of and to practice. Like when you are talking with people, you asked somebody what you think is a pretty dandy question, and they start telling you things that you already know and understand, you’ll go, “Why are you telling me this? You think I am some dim-wit? I am asking an intelligent question. Come on!” We want to cut the other person off, “Oh, I know that already.” Or “Oh, I studied that already.” Or “Oh, I heard that.” Kind of like “Tell me something better. Tell me something that fulfills the extreme of my intelligence.” Watch out when that mind arises. Watch out for the mind that doesn’t want to hear something that we already know, because we are afraid we are going to lose status. Watch the “I” at that time. Watch that feeling of “Oh, who are they going to think I am if I let them tell me something that I already know.” Watch how that comes up and then just say, “This is okay. I might learn something from hearing it again.” Try and feel okay with somebody telling you something you already know. Before we go on, are there any questions about pride? VTC: It definitely blocks practice. If we have the idea, “I am this good little meditator,” then we are smug in our meditation. We are not really practicing because there is this self-satisfaction and smugness. No progress is ever made. VTC: Right. For example, you are proud of your new skis, so you want to go skiing all the time to show them off. That becomes a big distraction to your practice. On one hand, you are building up your pride, on the other hand, you are wasting your time. VTC: Yes, that’s exactly it. It is very stagnant. Because it is very defensive, it is very protective of where it is at. And it is looking out for threats. I think we have to distinguish between the feeling of confidence or pleasure in what we do, and the feeling of smugness. We shouldn’t get those two confused. We should not think that every time we feel good about something that we have done, we are being proud, or we are being smug. That is an extreme. In the evening when we go home, we are supposed to go through what happened during the day and look at what went well. We are supposed to feel glad about what we did well, the virtues we created and the times when we were able to not get involved in our old negative habits, and have a sense of rejoicing. It is important to feel pleased about our positive actions and a sense of delight at what we have been able to do. But this is a very different sensation from feeling proud about it or feeling smug. The thing is, we often cannot discriminate between the two. If we are not in tune with what is going on in our mind, then we could very easily mislabel things and think that something is pride when it is not. What could also happen is that when we look at what we did do well, we generate pride instead of a sense of pleasure and rejoicing. We have to make sure we don’t generate pride over the virtuous activities we did but rather, generate a sense of confidence and pleasure. Also, we want to make sure we recognize the difference between confidence and a feeling of pride, so that we do not go to the extreme of thinking that we are being stuck-up whenever we feel good about something. That is not always the case. It is really important to recognize what has gone well during the day. VTC: Yes, it is true. The pride becomes super-sensitive so that we harden against any slight feedback we get that we don’t like. We become defensive and even quite aggressive due to our own lack of self-confidence. If we really feel good about ourselves, we will be able to tolerate some negative feedback. We do not feel it threatens who we are. When our self-esteem is shaky, then we cannot tolerate anything. Whether somebody is criticizing us or not, we will hear criticism and we will defend and attack back. VTC: Yes, exactly. How confused we are! It really feels like there is someone there that has to be defended. It feels like there is this real person whose integrity is at stake because somebody called us a name and it is solid. “YOU CANNOT CALL ME THAT!” The “I” kind of expands to fill the whole room. The next root affliction is ignorance. Definition of ignorance: Ignorance is a deluded state of unknowing brought about by the mind being unclear about the nature of things such as the Four Noble Truths, cause and effect, emptiness, the Three Jewels (Buddha, Dharma and Sangha). Ignorance is a state of murkiness. Actually, there are different ways to describe ignorance. One way is to describe ignorance as just an obscuration. Another way is to describe ignorance as actively grasping at a wrong idea. Let’s start out with the description of ignorance as just an obscuration, a general darkness in the mind. Ignorance is just this unknowingness, and within this unknowingness, the wrong view of the transitory collection grasps at an inherently existent person [this is the second description of ignorance]. There is an analogy that makes it quite clear. The room is very dim and there is something coiled and striped in the corner. You come along, see the coiled thing and you say, “Ah, it’s a snake!” In actual fact, it is a rope. But you are seeing a snake due to the dimness of the room. The dimness of the room is this general obscuration. The dimness prevents you from seeing that it is a rope. The Tibetan term for this general obscuration is mongpa. To me, it has this heavy sound to it, like “Mud-pa.” [laughter] The mind is just like “mud,” it’s thick, it can’t see things. This is ignorance. Within this general obscuration, there is this grasping at things as inherently existent, as when you think that the rope is a snake. Do you see the difference between the general ignorance and this grasping? Do you see they have different functions? Sometimes we talk about ignorance as being this general darkness or obscuration in the mind, and sometimes we talk about ignorance as being an active process of grasping things to be inherently existent when in fact they aren’t [inherently existent]. VTC: The innate grasping at the self or the “I” is this innate feeling of “I.” It’s what makes the baby cry when they are hurt. It’s what makes the baby afraid, it’s that very basic raw feeling of there being an independent existing person who needs to be defended, who is being threatened, who is important. Nobody taught it to us. It’s just we’ve had it from beginningless time. That’s why they say that ignorance is the root of samsara or cyclic existence. Ignorance goes back to beginningless time and it serves as the foundation for all of the other defilements. Based on this grasping at inherent existence, we generate all the other defilements. And then, on top of that we develop all sorts of philosophies. For example, we develop the philosophy that there is a soul; there is something that is “ME.” We are sure there is a “ME” because if there were no “ME,” then after I die, there would be nothing. We’ll make up a lot of philosophy. We’ll study it at the university and write theses about it. It’s all intellectual interior garbage, essentially. [laughter] We fall prey to these wrong philosophies so easily. VTC: Karma and ignorance are different. Ignorance is a mental factor. All the afflictions are mental factors. They are consciousnesses. Karma are actions. Karma is what we do motivated by the mental factors. The afflictions and the karma together caused the rebirth. Audience: Exactly how does grasping at true existence cause one to have attachment? VTC: Like I said, there are a few avenues that we can look at. First of all, if I see something as inherently existent, that means it has a nature or an essence all by itself, in and of itself. With some objects, part of that nature or essence is going to seem really wonderful. For example, the essence of pizza is definitely great, especially when you’ve been in India for a month. [laughter] When we see an object as inherently existent, it’s easy to over-estimate its qualities and see them as belonging to the object independent of anything else. The way you relate to objects also depends on the grasping at inherent existence. If I see myself as this isolated thing that is so real, then my happiness is very, very important. If my happiness is so important then I am going to start to analyze everything in terms of whether or not it gives me happiness. And so I am going to find that pizza does [give me happiness], chocolate does, and marshmallows don’t. [laughter] Just by the way I am looking at the “I,” that makes me look at everything in terms of how it affects me, whether it gives me pleasure or pain. These are a couple of ways how grasping at true existence leads to attachment. [In response to audience:] There are different kinds of laziness. One kind would fall under the ignorance category, the kind of laziness that just likes to lie around, sleep and hang out. Another kind of laziness falls under the attachment category. This is the laziness that keeps ourselves incredibly busy doing a lot of different stuff. The mind that is perpetually busy doing worldly things is considered lazy, because it is full of attachment. And it is very lazy in terms of Dharma. VTC: Remember we talked about the two levels of obscuration previously—the afflictive obscurations2 and the cognitive obscurations?3 The appearance of inherent existence is not a consciousness. It is the cognitive obscuration. It is quite subtle. Based on this appearance of inherent existence, we then jump in and say, “Yes, that’s true, that’s the way things really are!” This is grasping at things as inherently existent; a consciousness, an afflictive obscuration. It is much grosser than the cognitive obscuration. I think we get stuck on this question because of our Christian upbringing. Once upon a time, according to Christianity, everything was perfect, and only later did we get all the problems. Whereas in Buddhism, nothing was ever perfect. It was not as if we fell from perfection. We just never were perfect to start with. You see, we were not stuck with this question of where did ignorance come from, because things have never been perfect. Ignorance has always been there. Let us sit quietly for a few minutes and digest.